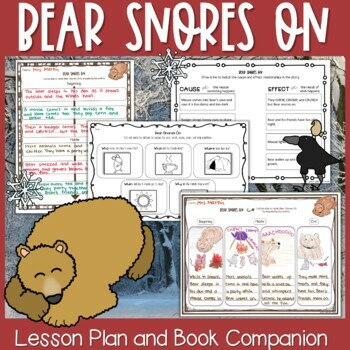 Cozy up this winter with this retelling lesson plan for the favorite, Bear Snores On! Bear hibernates peacefully is his den during the cold, dark winter. Soon, a mouse, hare, badger, and other forest animals decide Bear’s den is just the place to warm up and have a party. Nothing seems to wake the slumbering bear, even when they BURP, CRUNCH, and CHITTER. A pepper fleck finally wakes Bear as he sneezes a big ACHOOO! What will become of the forest animals when Bear finds them in his den? Students will love reading along and finding out what ensues as Bear snores on. This lesson is designed to be used with kindergarten and/or first grade students as a whole group read aloud. Extensions can be taken over several days. Students will participate in discussion through carefully crafted questions to recognize and sequence key events in the story. An anchor chart will make learning visible so that students make the connection between story elements and retelling. At the end of the lesson, students will answer the following question independently on one of three differentiated assessment options: Retell the story from beginning to end. Include important events in Bear Snores On. The essential question is: How can I retell a story? The lesson objective is: Students will be able to retell Bear Snores On using elements of a story. For the lesson, teacher resources include: teacher guide with skill rationale and teacher language, lesson plan with stopping points, questions and scaffolding questions for, post-its to print questions and place in book for easy reference. 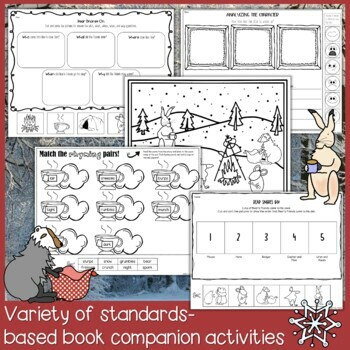 Story Map anchor chart headings and an optional student graphic organizer is available if your students are further towards mastery and could benefit from more independent practice. In addition to the three assessment options and graphic organizer, other student resources included: large, printable form of the essential question and student friendly objective, and six decorative vocabulary word cards (color photographs are also included that represent each word). Photographs of each of the animals in the story are also included. 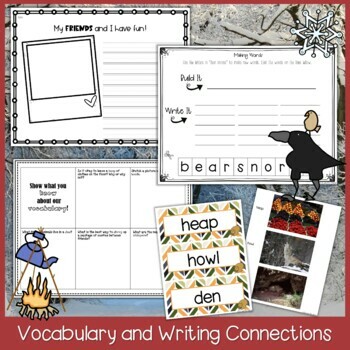 Character cards and transition word cards are available for varied retelling options. There are several great extensions to be used after the lesson! Students practice the strategy of visualizing. On the movie reel, students sketch the five most important events from the story. Then, label their sketches with key words from the text. Students use retelling strips with picture support to sequence story events and practice retelling the story. For students who do not need picture support, sequencing story events on post-its can be done independently or in groups. Just print one page of post-its per group. Students sort and stick on a sentence strip. Then, practice retelling the story in their own words. Students describe Bear’s feelings after he wakes up. First, they may sketch Bear to show his emotions and then describe him through writing. Students read and sort words from the text into rhyming pairs. Thank you for considering this product…please let me know if you have any questions! 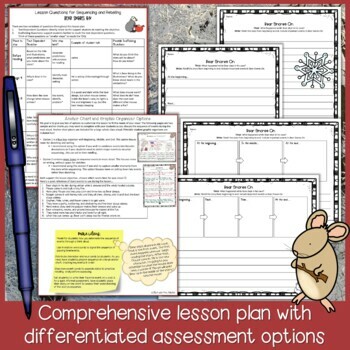 Check out other lesson plans in my store! After purchasing, you can receive TpT credits towards future purchases! Just leave feedback on this item and you will earn 4 credits to save you money on future downloads on TpT!